Heating, Ventilation, and Air Conditioning (HVAC) account for 13% of energy consumed in the U.S. and about 40% of the energy used in a typical U.S. residence, making it the largest energy expense for most homes. Even though more energy-efficient HVAC technologies are being adopted in both the commercial and residential sectors, these technologies focus on efficiently heating or cooling large areas and dealing with how the building's net occupancy changes during a day, a week and across seasons. Building operators have to tightly manage temperature for an average occupancy comfort level; but the occupants only occupy a small fraction of the building's interior. There is a critical need for technologies that create localization of thermal management to relax the temperature settings in buildings, reduce the load on HVAC systems and enhance occupant comfort. This is achieved by tailoring the thermal environment around the individual, thus saving energy by not over-heating or over-cooling areas within the building where the occupants do not reside. Syracuse University will develop a near-range micro-environmental control system transforming the way office buildings are thermally conditioned to improve occupant comfort. The system leverages a high-performance micro-scroll compressor coupled to a phase-change material, which is a substance with a high latent heat of fusion and the capability to store and release large amounts of heat at a constant temperature. This material will store the cooling produced by the compression system at night, releasing it as a cool breeze of air to make occupants more comfortable during the day. When heating is needed, the system will operate as an efficient heat pump, drawing heat from the phase-change material and delivering warm air to the occupant. The micro-scroll compressor is smaller than any of its type, minimizing the amount of power needed. The use of this micro-environmental control system, along with expanding the set-point range could save more than 15% of the energy used for heating and cooling, while maintaining occupant comfort. If successful, DELTA technology could increase energy efficiency, reduce emissions produced by powering traditional HVAC systems, and enable more sustainable heating and cooling architectures for energy-efficient building design. The innovations developed under the DELTA program have the potential to increase energy efficiency, improve overall building performance, and reduce HVAC energy consumption by at least 15%. The heating and cooling of buildings generates about 13% of the U.S. domestic greenhouse gas emissions. Through improved utilization of energy produced by fossil fuels with full adoption DELTA can reduce these emission by 2%. DELTA program innovations can help U.S. businesses eventually reduce reliance on tightly controlled building environments, thus enabling radical and sustainable architecture in next generation energy efficient building designs. Since receiving ARPA-E funding, the Syracuse team has developed an advanced micro-environmental control system, called μX, that is efficient, quiet, and compact. The first market envisioned for the technology is peak demand reduction in office buildings. In February of 2016, the New York State Energy Research and Development Authority (NYSERDA) provided Syracuse with a $400,000 follow-on grant to develop demand-reduction prototypes geared primarily for uses in New York City. The team has formed strategic partnerships with Air Innovations and UTRC and its affiliate Carrier, both of whom have extensive industry experience and relationships. The commercial promise of the μX is due in large part to the team’s novel approach. 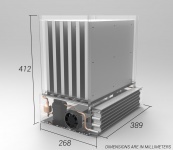 The μX utilizes a thermal storage module containing phase change materials (PCM) that freeze at about 60°F to store ten hours of “cooling.” Syracuse and its partners engineered and fabricated a novel, high-performance micro vapor-compression system to produce the cooling capacity overnight. During the day, small, quiet fans blow about 20 cubic feet per minute of room temperature air (79°) through the frozen PCM module, cooling the air to a comfortable 71-72°F. By freezing PCM at night, the system avoids making noise and releasing heat while the workstation is occupied. During heating season, a heat delivery device is used to add 18 W of heat to a person. Preliminary test results of the prototype indicate that it can remove more than 32 W of heat, surpassing DELTA’s target of 23W. For a detailed assessment of the Syracuse project and impact, please click here.